The canteen may be many things – a place to socialize, relax, and eat, but it is rarely, if ever, a cause for controversy. As of late, though, an interesting phenomenon has come to light. As those of us who frequent RJ Confessions may know, it is a widely held opinion among many students that some stalls charge arbitrary prices or dole out different amounts of food to different people. While RJ Confessions is certainly not the most authoritative of sources, it is important for us to examine the veracity of these claims. Raffles Press decided to set up an experiment to find out, revealing the truth of the matter once and for all. 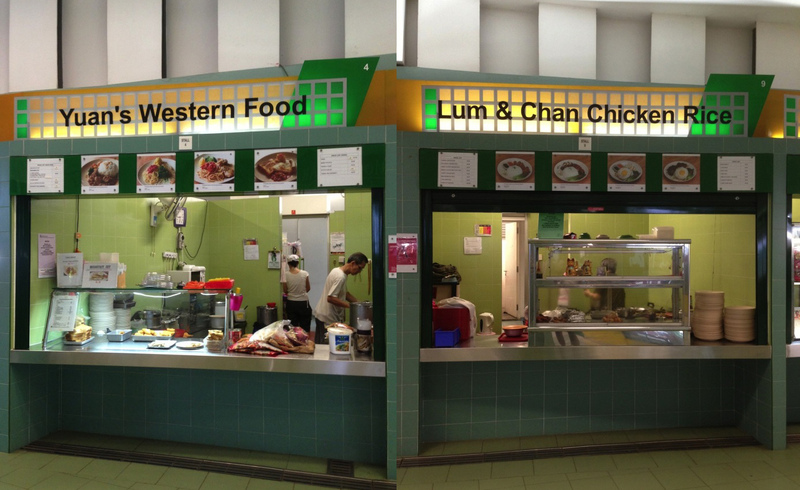 Raffles Press carried out an experiment on two stalls – Lum and Chan Chicken Rice and Yuan’s Western Food. Over a time span of 40 minutes, four pairs were sent to buy food from the canteen. Two pairs went to Lum and Chan Chicken Rice, while the other two headed towards Yuan’s Western Food. Each pair was to buy the same dish or the same combination of add-ons. Finally, the prices charged, and the portion sizes provided were then recorded and compared. Given everything in set meal except baked beans. From the experiment, it appeared that prices were inconsistent with the amount of food provided in these two stalls but not always so. There was inconsistency in the first three cases, but not the last one. Therefore, it is not possible to generalise that prices in these two stalls are always random. Despite this, it is evident that the prices and portions in these two stalls are not always consistent and is an issue worth looking into. Interestingly though, Mr. Seow also remarked that for noodles, he charges $1 sometimes and $1.20 at others. Mr Seow claimed the variations in price were deliberate, as he varied the quantity of noodles served. From what we gather, most students do not know about this. This may be a reason for price variations – stall owners changing rates depending on quantity served. We also spoke with Mr. Lum, the stall owner of Lum and Chan Chicken Rice. He too maintained that his prices were always fixed. As seen from our findings, prices were indeed constant at times. If what the stall owners claimed was indeed true to a certain extent, what could the reasons for fluctuations in prices be? Perhaps, stall owners vary the prices charged unknowingly. For all we know, the stall owners are simply too busy to calculate the price accurately all the time or to remember the prices of certain dishes, thus ending up estimating prices instead. For instance, stalls like Yuan Western food have a lot of different dishes which they vary from day to day; hence it is easy to make mistakes when quoting the price of a dish especially during rush hours. Combinations of add-ons and quantities also differ from plate to plate, so it is difficult to standardize the price as well. It is also possible that they occasionally run out of certain add ons, like baked beans and onion rings, so you might still have to pay the same price for the set meal even if one add-on is missing. One prevailing opinion is that the portion served and price charged might depend on the customer’s appearance. For instance, a well-built student might be served more food as compared to his scrawnier looking companion. We put this hypothesis to the test as well, gathering different groups of people for a repeat of our experiment. Comparing the portion of servings and prices with their physique, we found no clear relationship between appearance and price or quantity of food. From our observations, we also found that price and quantity variations are less frequent in the chicken rice stall than the western food stall. The majority of our respondents told us they had never experienced such discrepancies when patronizing the chicken rice stall. If the price quoted seems unreasonably high, appear shocked and ask if you heard it right the first time. The stall owner might then reconsider the price. 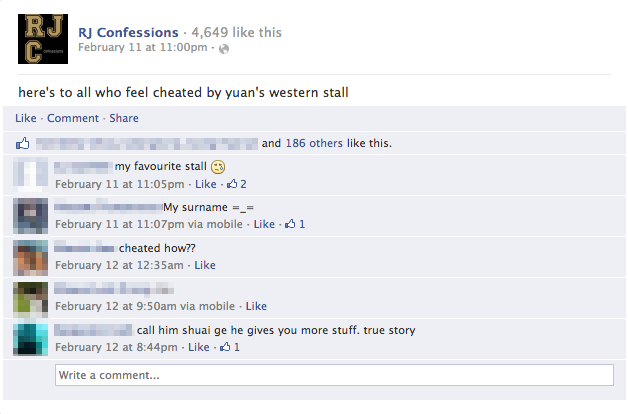 For the Western Stall, try to get meals like spaghetti bolognese and stewed beef since the prices are already fixed. If you are friends with the stall owner (they are very nice people) then they might treat you well and even give you a discount! If you are ordering a set meal, confirm that all the add-ons are still available so that you will get your due portions. The stall owner can’t help it if there are no mashed potatoes left. Since the stall owners sometimes seem to offer the first price that comes to their mind, it might be good to calculate the price charged based off the printed menu before they can. For instance, asking “So would that be $2, uncle?” might help. Diary of an RI Intern: Writing is No Child’s Play! 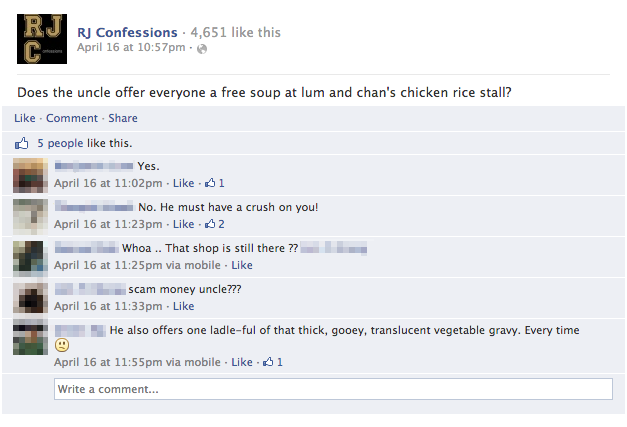 There’s always free soup at Lum and Chan’s! You just have to ask and the uncle will always give you a bowl.